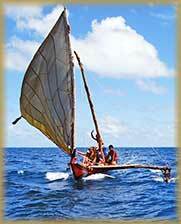 The Yap Traditional Navigation Society is a non-profit organization that was incorporated in 2005. The primary goal of this group is to ensure that the traditional navigation and canoe building practices, an essential part of the Yapese culture, are promoted and preserved. To achieve this goal, the Yap Traditional Navigation Society founded a school, the Yap Traditional Maritime Institute in July 2006 with courses beginning in September of the same year. The purpose of this school is three-fold: 1) revitalizing and maintaining the traditional Yapese canoe building, sailing and navigating practices, 2) economic development with the use of traditional practices and, most importantly, 3) re-instilling cultural pride in the youth and communities of Yap. 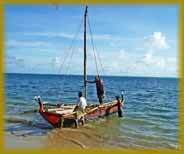 As a service to our island guests, the institute offers traditional canoe tours. These tours are a once-in-a-lifetime opportunity to join world famous celestial navigators as they demonstrate the art of carving, sailing, and navigating while providing you with extraordinary sights of Yap and her people. Arrangements can be made for a tour through your hotel operator. As a retired American journalist and reporter for the Minneapolis Minnesota Star Tribune newspaper, told us in a recent letter, traditional canoe rides are a genuine experience and a real "treat" when one visits Yap. The crystalline clear water lapped two inches below me as we sped along with the wind in the bright day. 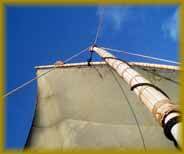 The four men working the handmade canoe of mahogany, and bamboo kept the nylon sail flowing against the gentle breeze in the Wacholab lagoon off the northeout rigger on clear blue waterrn island of Maap in the archipelago of Yap. The sun warmed my shoulders, the water spray cooled my feet, the sea reflected blue and aqua and green and white and navy. On the horizon the fierce breakers slapped over the coral reef and at my back the incredible green of coconut palm, mango trees and pristine sand shore line outlined the lagoon. a view of the island from the canoeI was on an outrigger canoe, handmade by men in the village of Wacholab. 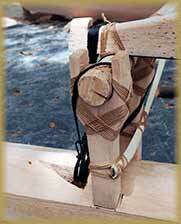 The rudder was a hand carved piece of wood fashioned with a little chip in one side to set it on the side of the boat. The canoe was a dug out with sides lashed to it with fibers. The ship was about 30 feet long and three feet wide and it flew over the calm lagoon waters as seemingly easily as one of the tropic birds that flew past us and barely looked down. My traveling companion, Joanna Pegum and I were witness to a wonderment of invention. Just think: This is the way the ancient mariners made their way from island to island in this edge of the vast Pacific Ocean. crewman adjusting the sailAs we sped along I could just sense the way the sailors of the past headed out from the safety of their own lagoons and took on the huge breakers, setting out to sea and grand adventures. 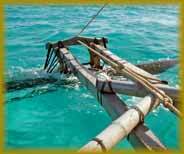 One villager showed us a similar canoe that he and his mates took from Yap to the Island of Palau a few hundred miles away _ just last year. As the village chief and our pilot on that lovely day, Bruno Tharngan, said these ships are still being used. They are a part of Yap’s past and its present and its future. 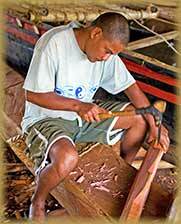 Taking a traditional canoe ride when one visits Yap is a must, I think. It will give you a sense of what life has always been like for the fabulous people and also get you gliding gently directly over the surface of the ocean that covers one third of the globe. For a girl who grew up in the middle of Great American prairie and plains and swam only in swimming pools this was truly an adventure of a lifetime.